Dexter Daily: POLL: Which Season Finale Episode of Dexter Is the Best? 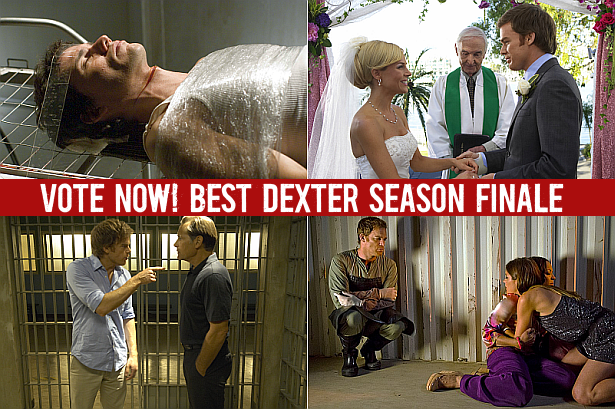 POLL: Which Season Finale Episode of Dexter Is the Best? Eight season finales of Dexter. Which of them is the best/your favorite? Vote in our poll below! Season 1 finale. Dexter follows the clues left for him by the Ice Truck Killer in an effort to rescue his kidnapped loved one, while Rita's ex tries to convince her that Dexter is too dangerous to be around their children. Season 2 finale. Lundy and the FBI settle the case of the Bay Harbor Butcher once and for all but the heat's not entirely off Dexter as his world literally becomes an inferno. Can he rise from the ashes once again? Season 3 finale. Dexter attempts to calm the emotionally unstable Ramon now that Miguel is out of the picture; Debra is about to receive her detective's shield but is blind-sided with information that could derail her promotion. Season 4 finale. Dexter and Arthur find themselves on a collision course, as Debra unearths a shocking long-hidden truth, Rita admits her marriage to Dexter is troubled, and Batista and LaGuerta face the consequences of an ethics breach. Season 5 finale. Dexter realizes that he and Lumen are being lured into a trap and risks everything to escape; Debra lets her personal feelings overwhelm her instincts in the Barrel Girls case; Quinn needs help that only Dexter can provide. Season 6 finale. Dexter and Homicide race against a lunar eclipse to catch the Doomsday Killers before their final gruesome act; Debra struggles with a new emotional reality. Season 8 finale - Series finale. Dexter is faced with impossible odds as a brewing hurricane makes its way towards Miami. Which season finale episode of Dexter is the best?